Most people younger than 40 may not even recognize the name Don Ho. It’s probably not even vaguely familiar; not stored even on a single synapse way in the back there from when you were channel surfing and accidentally heard his name as an answer on an episode of Jeopardy. 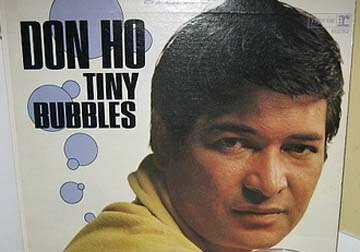 Well Don Ho was a Hawaiian who had a brief few moments of pop music fame with his ballad-diddy Tiny Bubbles. He would honor WW II veterans from the Pacific theater at all of his shows, inviting them up on stage to dance with his accompanying hula girls. Other than the name of the song, Tiny Bubbles, he has nothing to do with this post. I just wanted to link together a pretty cheesy song and the bubble discussion underway all over the internet. If you’ve managed to find this blog post, you’ve probably read all about the debate about whether or not we’re in a new internet bubble. I’ve recently put myself pretty squarely in the no-bubble camp after flirting with the other side. The Economist seems to be a bit more concerned in this May 12 article. Reading the article made me realize that many crooning on the debate have incorrectly framed the question. The 2000 bubble wasn’t a bubble, it was a ga-jillion bubbles. All boiling up in a rolling, frothing pot on the economic stove with the gas up high. The National Venture Capital Association reports that in 2000, $100 billion was invested by venture capital funds in 7,900 transactions. That, by the way, is about $12.75 million per investment. 9 consecutive quarters passed with at least $10 billion invested (Q2, 1999 through Q2, 2001). Q1 of this year saw only about $5.8 billion invested. That’s one of the better quarters of the past 2 years, but still roughly 30%+ off the pace of the pre-recession 2000’s, let along the pace of the true bubble-era. Here’s the point. In Q2 of 2001, the cooks in the kitchen noticed that the pot was boiling over. It’s hot, steamy bubbles flowing over the rim of the economic pot. It was making quite a mess! All the cooks came running over and grabbed the pot and hurriedly took it off the stove and they reached down and turned off the gas. The September 11 attacks removed any ideas we had of quickly turning the pot back on. We eventually started cooking again, but the mortgage derivative crisis was a real doozy…it was like the gas company shut the whole dang building down for the past couple of years! So here we are, a bunch of smarter cooks now, and we’ve put the pot back on the burner and turned the heat on low. Even a low flame will start to heat the water. And if you ever watch water come slowly to a boil, you’ll first notice….wait for it….tiny bubbles. Stop whining about them. Remember people, you want the water to boil, right? We’ll never eat without boiled water, so we need an occasional overvaluation of a company with over $800 million in revenue. We need an occasional irrational $41 million investment amount in an untested company. (It helps us current investors not suffer 3x liquidation preferences!) What we don’t want is for them to be happening every day. What we don’t need is companies closing $6 million rounds on Tuesday and by Friday have an offer for another $6 million at double the Tuesday valuation. And mostly here’s a toast, To you and me. This entry was posted in Seed/Venture Capital and tagged bubble, Don Ho, investors, NVCA, venture capital. Bookmark the permalink.